In the early 70’s before the war there was a question to improve military defense. The existing "Shilka" had been unsatisfactory range, and I had to do something. As a further development of the "Shilka" was a complex "Tunguska", which has not only a larger caliber gun, but the rocket. However, the development of the means of attack, such as responsive bombs or cruise missiles required to revise views on defense troops and facilities. In addition to the rocket and gun "Tunguska" was required to create a purely missile short-range anti-aircraft system. The main goal — to accompany the troops on the march and, if needed, to cover against air attack stationary objects. Creating a SAM instructed the Moscow Research Institute of electromechanical (NIEMI) was engaged in the creation of the rocket MBC "Torch". And already in 1986, the armament was "Tor". 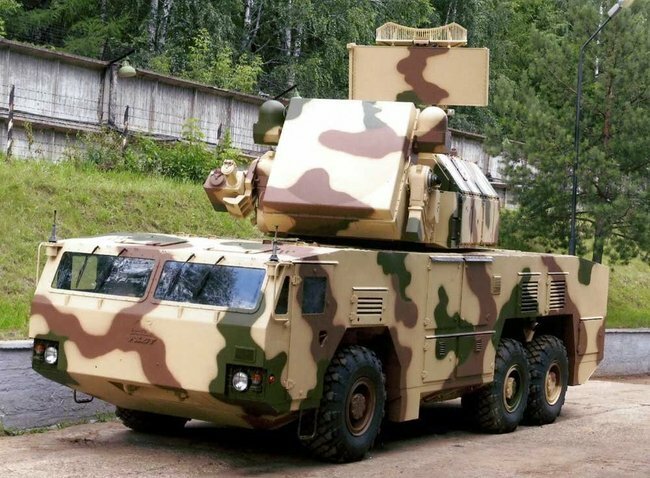 The new self-propelled air defense system as the "Tunguska", received ammunition from eight missiles, but the missiles 3M330 "Torah" has a larger attack range — up to 12 kilometers to eight at the "Tunguska". Also, "Thor" has a greater height defeats the purpose — to 6 km. As the chassis for "Torah" was chosen tracked chassis GM-335 of the Minsk Tractor Plant. As in the case of the "Shilka" missile system was to be able to accompany the troops on the march, including the terrain. Even at the stage of creating SAM image of this terms of reference exclude the requirement to overcome water obstacles swimming: in this case, the complex would have made much more difficult and more expensive. The characteristic features of the "Thor" became the vertical position of the rotating missiles and "tower" — antenna-starting device bearing the two radar antennas (stations target detection and guidance systems), it is also vertically arranged launchers for eight rockets. In the late 80’s were modernized complex. In addition to the updated equipment "Tor-M1" has a new transport and launch container under the symbol 9YA281 for missiles. Now they are loaded for not one, but a "package" of four. Due to the new TPC managed to reduce the time to reload SAM 20-25 minutes. Also based missiles 9M330 9M331 was created: it has a new warhead and some design improvements. Since the early 2000s, is working on the following modification of the "Torah" — "Tor-M2". Once again, the revised composition of complex electronic equipment. The main objective pursued by the designers — providing of SAM in electronic countermeasures, including the attack of targets with low ESR. To do this, "Tor-M2E" received some new equipment modules (the exact composition of the replacement, of course, top secret), slotted phased array and new software detection stations purposes. The list of potential targets, "Tor-M2E" now includes not only aircraft and helicopters, and precision-guided weapons (missiles and bombs), unmanned aerial vehicles, etc. Thus, for the purposes of attack now uses two channels do not like "Tor-M1", and four, and the height of destroying targets increased to 10 km. — Fighting machine. Either 9A331MU crawler or wheeled 9A331MK MZKT-6922. Both bogies are manufactured at the Minsk Tractor Plant. 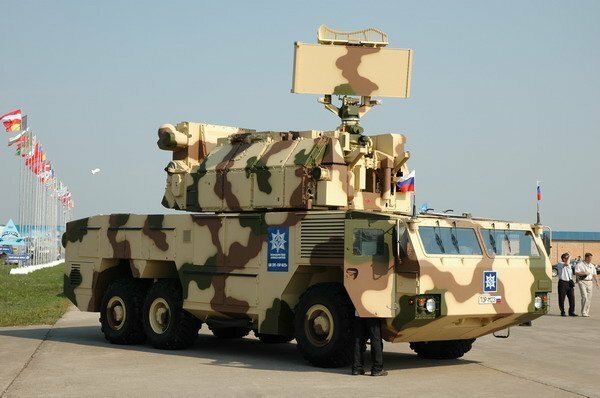 The "tower" with launchers and radar antennas and equipment are completely analogous. 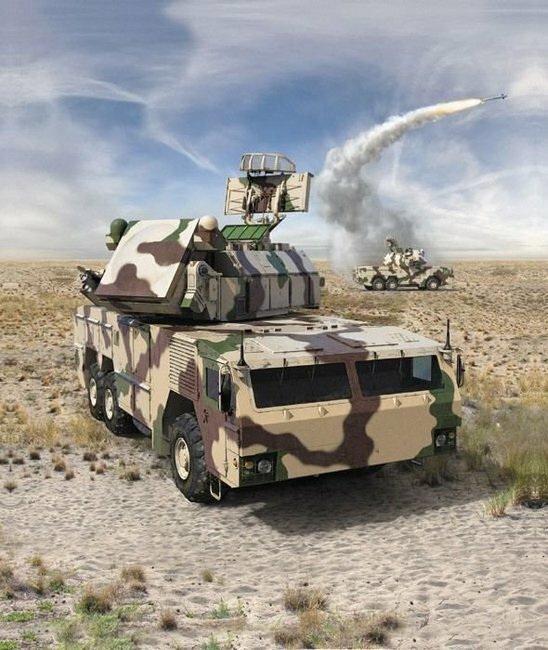 — Anti-aircraft Missile 9M334 module consisting of a container, four 3M331 missiles and two special beams to connect it to other containers. 3M331 missile can hit the aerodynamic targets flying at speeds up to 700 m / s and maneuvering with an overload of up to 10 units. To counter the "dances" target missile can maneuver with an overload of up to 30 units. The rocket is made of mortar manner, and at a height of about 15-20 meters is launching its main engine. Also, the motor can be switched within 1 second after the ejection rocket TPK or by rocket deviation from the vertical at an angle greater than 45-50 °. — Transportation and loading vehicle 9T244 set handling equipment, etc. Apparatus combat vehicle designed to detect, identify and track targets as the parking lot, and on the go. To launch the missile, in turn, requires stopping the machine. After missile launch "Tor-M2E" can again get a move on and catch up followed by division. At the same time, "Tor-M2E" can "see" and track 48 targets ten of them, simultaneously determining their risk. To improve the efficiency of the "Tor-M2E" has a so-called pipelined mode: to attack a single target using one destination channel, as soon as the rocket ground controlled output to the target and hits her, the channel can be instantly switched to attack the other. Thus, the "Tor-M2E" has a great opportunity to repel the massive attacks of the enemy, than its predecessors. Another innovation "Tor-M2E" refers to the interaction of military vehicles. If necessary, the two machines can be combined into a link, and share information about the goals. In other words, a target detected by one car, immediately recognize the other and vice versa. As the mode of "link" allows you to distribute the surrounding space between two cars and, as a consequence, to provide more effective cover of the object. In addition, a missile fired by one car, can be induced by means of the purpose of the second set. In addition to working together "link" can not get out of a fight with a damaged car station setting goals — in this case, all the necessary information will go with the other "Thor", which consists in the link. Due to the large automation equipment has reduced crew of four people at the "Thor" and three from "Tor-M2E". For the first time the general public learned about the "Torah-M2E" at the MAKS-2007, and the following year the park was the Russian Army. The most recent modification of the "Torah" and interested foreign country with Belarus has signed a contract for the SAM battalions and a contract with Libya from 2008, seems unlikely to be made according to objective political and economic reasons.